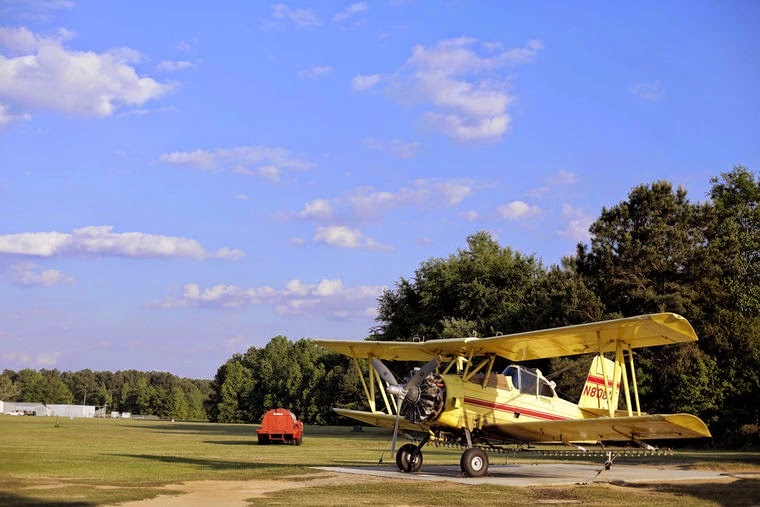 A cropduster sits at Huggins Memorial Airpark on May 2 in Timmonsville. Like his father, Sonny Huggins cropdusted for years before transitioning to working as a pilot for the South Carolina Law Enforcement Division. TIMMONSVILLE, S.C. – When you live at an airport – whether it’s by choice, some feeling of obligation or a little bit of both – flying works its way deeply into your life. Death, too. M. B. “Sonny” Huggins III passed away Feb. 14 in a Myrtle Beach hospital. Family members were close by, including his wife of 30 years, Bettie. “My son looked at me and he said, when he [Sonny] drew his last breath: ‘Momma, it’s 2:10,’ ” Bettie said. The significance of the time was immediately evident to the loved ones. It was a fitting nod to Sonny’s favorite airplane, the Cessna 210. Sonny was a pilot through and through. He made his first solo flight when he was 11. His 17,546 flight hours add up to more than two years in the air. He and Bettie got married while in flight. The grass-stripped Huggins Memorial Airpark – described by author, journalist and pilot Bill Walker as “long on flying history and short on formality” – handles a combination of recreational pilots and crop-dusters. Planes sit under corrugated metal hangars, or are secured to concrete pads outdoors. Vines creep into the cockpit of a propeller-less Cessna, parked in a stand of trees. The airport was founded in 1931 or 1937 (there is some debate) by Sonny’s father, “Dusty,” who earned his nickname during the early days of cropdusting, first in Louisiana, then South Carolina, North Dakota and Minnesota. Dusty would fly in Santa Claus for Timmonsville’s Christmas Parade, a tradition that Sonny kept up after his father passed away. Also like his father, Sonny worked for the South Carolina Law Enforcement Division as a pilot. For 28 years, he spotted liquor stills, fleeing suspects, missing persons and marijuana plants from the air. “I just want to fly until I can’t do it anymore,” Sonny told Walker in 2005. In a few weeks, Bettie hopes to give Sonny one final opportunity to fly, during a celebration of life service where his ashes will be spread from his favorite airplane. 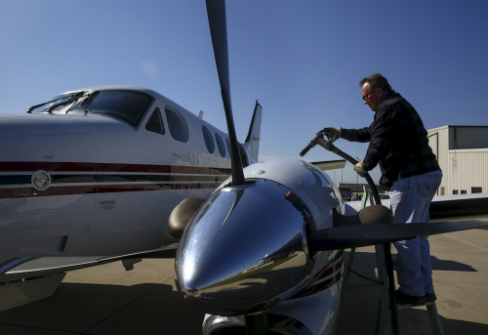 Bill Button, an employee with Morris Municipal Airport, fuels a turboprop airplane from Minnesota after it landed Wednesday. The airport will extend the northern portion of its runway by 500 feet with more than $1 million being poured into the project. Construction will begin May 18. MORRIS – An out-of-state company’s board of directors recently thanked Morris Municipal Airport for its convenient location and accessibility. After departing Shreveport, Louisiana, at 8 a.m. with the company’s full board and landing in Morris for a tour of a local plant, the corporate jet landed back in Shreveport by 3:10 p.m. the same day, Morris Mayor Richard Kopczick said. 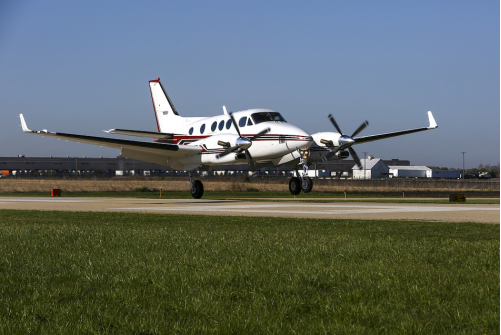 It’s just one example of the smooth point-to-point travel offered by Morris Airport to nationwide businesses with locations in or near Grundy County. More than 50 corporate accounts are registered to land on the 5,000-foot runway and store aircraft, Vogen said, and there’s a waiting list that officials anticipate will only grow as airport development continues. With the expected growth in mind, the city has a five-year forecast for airport improvements as part of its Transportation Improvement Plan. The most immediate part of the plan begins May 18 with the extension of the runway to 5,500 feet. The city obtained numerous parcels of land in recent years to make expansion possible. Whitman Road was extended west of Ashley Road with a bridge and roadway to give residents on that road new access, since the airport work no longer allows direct access to Route 47. The plan is done in collaboration with the Federal Aviation Administration and the Illinois Department of Transportation Division of Aeronautics. It’s just one more aspect that makes the Morris Airport attractive. It will add, for instance, to the existing perk of avoiding the airspace of Chicago O’Hare International and Chicago Midway International airports. The Louisiana board of directors told Morris officials they would never fly into O’Hare again. The work scheduled to begin May 18 is a $1.3 million project to extend the runway to 5,500 feet, along with an extended taxiway and upgraded runway lighting. The 500-foot extension will be at the north end of the runway, which runs North-South. Morris City Engineer Guy Christensen said it’s become a straightforward project after the land was acquired and streets were altered. Vogen said because of the current set up, weather can be more of a factor and deter a jet from landing in Morris. The airport will use the Wide Area Augmentation System developed by the FAA and a localizer performance with vertical guidance procedure. The GPS-guided landing procedure will make the airport one of more than 1,700 U.S. airports using the set-up, according to FAA.gov. Aircraft will be guided to a safe landing by the upgraded instrumentation during fog, rain, snow and low clouds. The new instrument landing system gives aircraft a precision approach from as low as 250 feet, Vogen said. Lighting arrays provide lateral and vertical guidance when approaching a runway. “It just makes it a lot safer, especially in the winter,” Vogen said. The hopes for airport improvements expand beyond the runway. Two local business owners and plane owners are in talks with the city to build private hangars for their planes, Vogen said. Kopczick said an example of a hangar lease would be a 20-year agreement with a 10-year option. The city collects rent on the space, and if the deal expires without a new one being made, the land is city property again. The comfort provided to the plane owners benefits the city. With less space occupied in the airport’s general aviation hangar, planes from out of town will have space too. With a waiting list on T-hangars for smaller planes, the airport may add 12 T-hangars. Aircraft on the existing runway line up directly North-South, but there are days when west winds are so strong it will alter takeoffs and landings of small planes. For those days, a diagonal crosswinds runway gives small planes a safe alternative. Having a second runway that runs East-West that intersects with the existing one is a future hope for Morris Airport. Much like the acquisitions for extension of the existing runway, the city would go through a lengthy process of acquiring land for the hoped-for crosswinds runway. The land acquisition is estimated at $5.2 million, Kopczick said. It’s unknown how long acquisition would take. Before that can happen, an environmental assessment of the potential construction area at a cost of $160,000, split 50-50 between the state and Morris, will be completed. To accommodate more frequent use from large corporate jets, the city hopes to have the soon-to-be extended North-South runway widened from 75 to 100 feet, estimated at $3.7 million, and strengthened with an overlay of more asphalt, estimated at $2.8 million. If approved by all parties, cost would be split 90 percent federal, 5 percent state and 5 percent Morris. The city hasn’t calculated a cost for crosswinds runway construction, but if the proposed project proceeds it would come with a bonus: If constructed before the widening and strengthening of the North-South runway, the second runway would allow the airport to stay open for local air traffic. If not, the airport would close for a year while the widening occurs. The city considered widening first, but decided it’d be best to keep the airport open. If the city encounters too many obstacles in the environmental assessment and land purchase, Kopczick said, it may agree on widening and strengthening first. “But the hope is to build a second runway first,” he said. 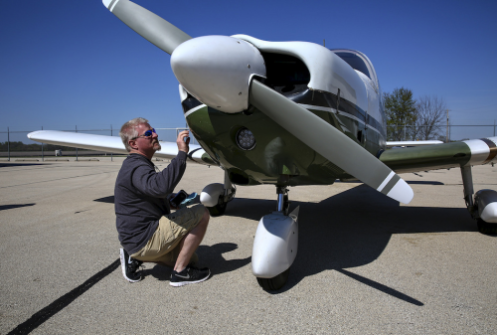 Rich Toth inspects Wednesday a Piper Cherokee airplane at Morris Municipal Airport before flying with his friend, Greg Thorson. Floyd Maxson, assistant chief pilot, prepares to take off for Gotham Air’s new helicopter shuttle service for commuters at Linden Airport. 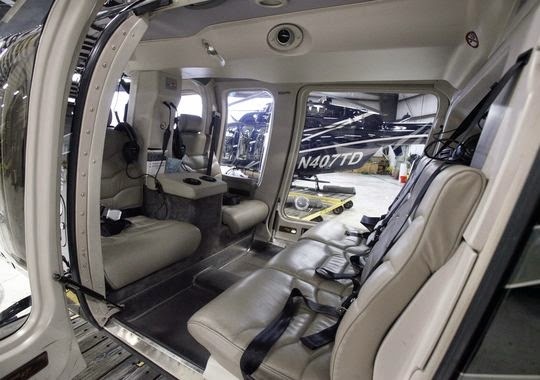 Interior of one of the helicopters at Gotham Air’s new helicopter shuttle service for commuters. WALL, NEW JERSEY – Imagine skipping the tolls, tunnels and bridges when heading into New York City. In fact, imagine skipping the drive all together, and arriving in less than 20 minutes. No, teleportation hasn't been invented, but there is a new company that pledges to cut the daily commute into the city in a major way, although it won't be cheap. 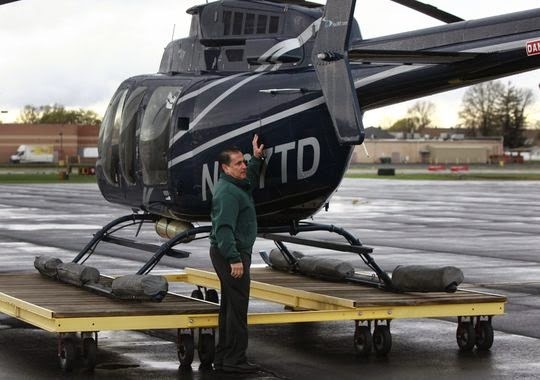 Gotham Air is a helicopter charter service that promises to shuttle commuters from Monmouth Executive Airport in Wall to the Downtown Manhattan Heliport, about three blocks away from Wall Street in approximately 14 minutes, said Gotham Air owner and CEO Tim Hayes. The service is set to begin Memorial Day and run until Labor Day. Ruthie Stoakes, manager of the Monmouth Jet Center at the Monmouth Executive Airport, said the terminal can be used by any privately owned company, and sometimes similar operations have utilized the terminal. "Adding us to their schedule – we'd love that," she said. "The more the merrier. We're more than willing to work for them," she said. Hayes is no stranger to a commute. A former Maplewood resident who commuted into the city for work every day, Hayes eventually moved his family from New Jersey to Manhattan to cut that time. "It was a relatively short commute but I missed dinner every night and I didn't like that," Hayes said. "We're not trying to make people feel like a movie star. We're trying to get people home for Little League, for dinner." That's not to say the helicopters aren't luxurious, or the tickets cheap. Gotham Air is encouraging people to buy monthly packages by letting those customers sign up first. Hayes said he and business partner John Kjekstab, a former helicopter flight instructor, realize that there is a niche demographic the company will appeal to. For June, the cost of a monthly package is $7,799 for daily round trips from Wall and $6,379 for daily round trips from Morristown Airport. The cost of the package will depend on how many days are in a month, a company spokesperson said. Hayes said the ticket cost isn't exorbitant when the cost of tolls, tunnels, gas, and parking daily are factored into the equation. "It's not for everybody, but someone who drives a BMW 5 or 7 series ... this is not that big of a step up," he said. "It's a premium product for someone who works in Manhattan and is done at 6 (p.m.) and is not home until 8 (p.m.)"
To start, Hayes said the company will fly one commuter trip per morning. "But as we share our story, we're prepared to do multiple trips a day," Hayes said. "We'll make sure we'll ramp up the service." Without a package, passengers will be able to purchase a ticket for $179 one way. 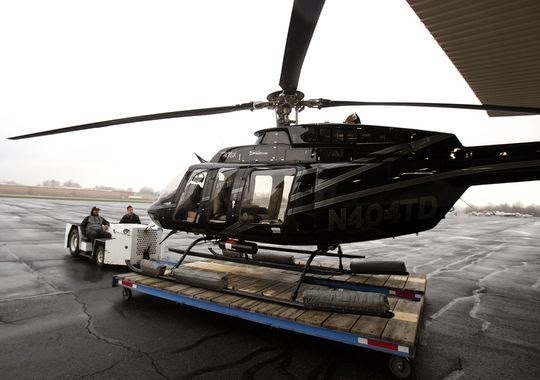 Passengers who would typically drive almost 90 minutes – without traffic – into the city, could be there in a fraction of that time by way of one of Gotham Air's fleet of seven Bell 407GX helicopters. "We're the only brand in the Northeast (to fly this model)," said Hayes, who also added the model makes use of military-grade quiet technology that physically reduces the sound of the helicopter flying. "It's noticeably quieter when you fly overhead," he said. "We want to be a positive (for) customers and the community. We don't want people to see us as noisy rich people coming in helicopters." The helicopters seat six passengers and go from the ground to airborne and traveling 150 mph in about 90 seconds. Is the ferry commute worth the cost? Hayes formerly worked for ABC's "Good Morning America" and as a concert promoter. Through those careers he became familiar with moving people around quickly via helicopters. The bills for short rides however, were thousands of dollars. "The aircraft is expensive but tickets doesn't have to be that much," Hayes said. "(In) the sightseeing business they're able to take people on 16-minute Manhattan tours for $150. Why is it a 16-minute flight costs $150, but $2,200 if you're going on a six-minute (flight) to the airport?" Hayes reasoned that if a helicopter is chartered for the day, and the pilot spends most of the time on the ground, the cost of the pilot, aircraft and fuel is different than if the service ran all day long. By flying multiple flights throughout the day, the cost becomes spread out amongst more people, and becomes more manageable. 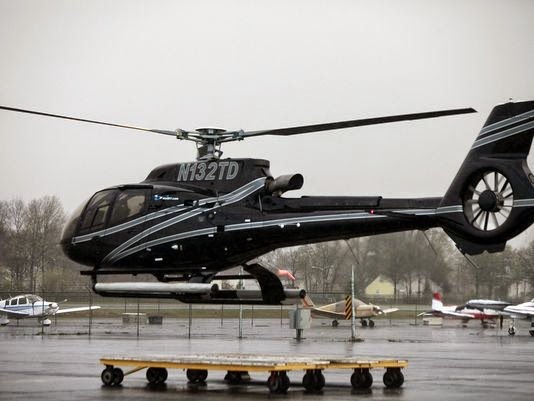 The company will also offer round-trip charters from Manhattan to the Hamptons, Martha's Vineyard and Atlantic City, as well as shuttle services from Manhattan to area airports. A helicopter is brought out of the hangar for Gotham Air’s new helicopter shuttle service for commuters at Linden Airport. John Field stands with his mom, Marcella Field, near the airplane he built himself, N35JF. Marcella was her son’s first passenger in the plane, once it passed a safety inspection and trial period. Many people have dreamed of flying through the clear blue skies. Most people can only achieve that through imagination or an airline ticket. But for John Field, taking to the skies starts with simply taking a seat behind the controls of his own airplane. Field, a River Falls native, didn’t just decide to go out and buy himself a plane. A licensed pilot, with about 40 years of experience, Field built the plane himself. He used a kit to build the RV4 airplane. The RV4 kit made by Van’s Aircraft company. He bought the blueprints in 1987 and started working on the plane in 1990. It took 22 years to finish. Field did most work himself, though he had help from a friend when bucking the rivets. Field learned a lot from the building experience. He said he knew how to fly planes when he began, but not much about building them. “Pretty much everything I did I had to learn it,” Field said. “Every new kind of thing I got into, I had to read up and study about how it was done correctly. That’s one reason it took so long for Field to build the plane. That also allowed him to really customize the plane to himself. Field said it has definitely been worth the 22 years of work. Field finished his airplane in July 2012. After a Federal Aviation Administration (FAA) inspection, Field began an FAA-required 40-hour test phase. After a successful trial period, he was free to take passengers and go wherever he’d like. His first passenger was with his 83-year-old mother, Marcella Field. Field now flies his airplane out of the New Richmond airport where he also stores it. He doesn’t fly much in winter, but over the summer he usually flies about once or twice a week. He’s flown over River Falls, and all over Wisconsin. 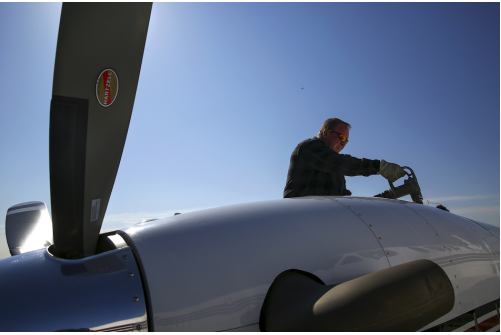 He’s taken his plane on trips to Madison and Arizona, with a few stops to refuel on the way. Though Field doesn’t have to file flight plans with the FAA, he does take safety very seriously. 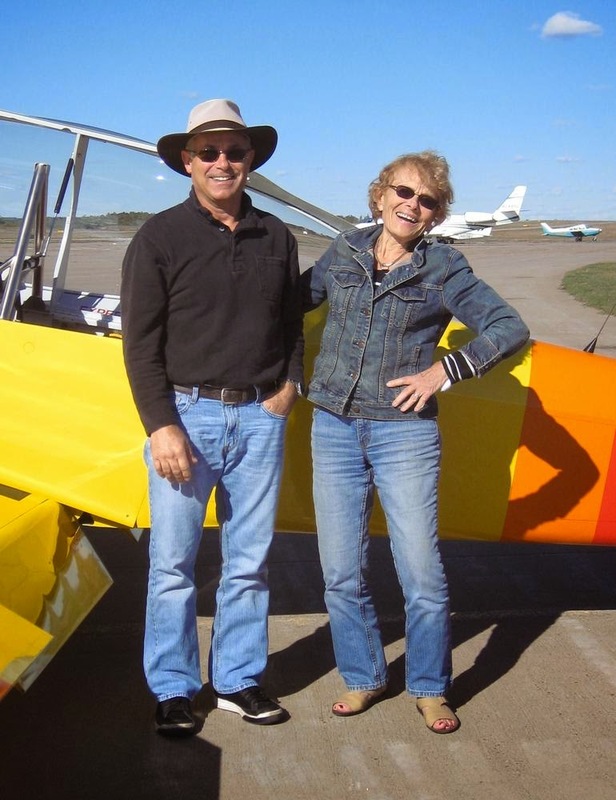 A 1975 River Falls High School graduate, Field started learning to fly in 1976 at the Lake Elmo, Minn., airport, where he earned his private pilot’s license in 1978. But, he said, he really learned to fly while he was an F16 instructor for the U.S. Air Force. Field, whose father George Field was a UW-River Falls chancellor (1968-85), joined the Air Force after graduating from UWRF in 1982. He left the Air Force at the end of 1989. He later flew business jets for Dayton’s and the Target Corporation for 15 years after that. Field’s plane has a 20-foot wingspan, weighs about 1,000 pounds empty, and has a 160- horsepower engine. That means it can fly up to 210 miles per hour. It can go up to 17,500 feet with the oxygen system it has in place. The complete story can be found in the April 30 print edition of the River Falls Journal. 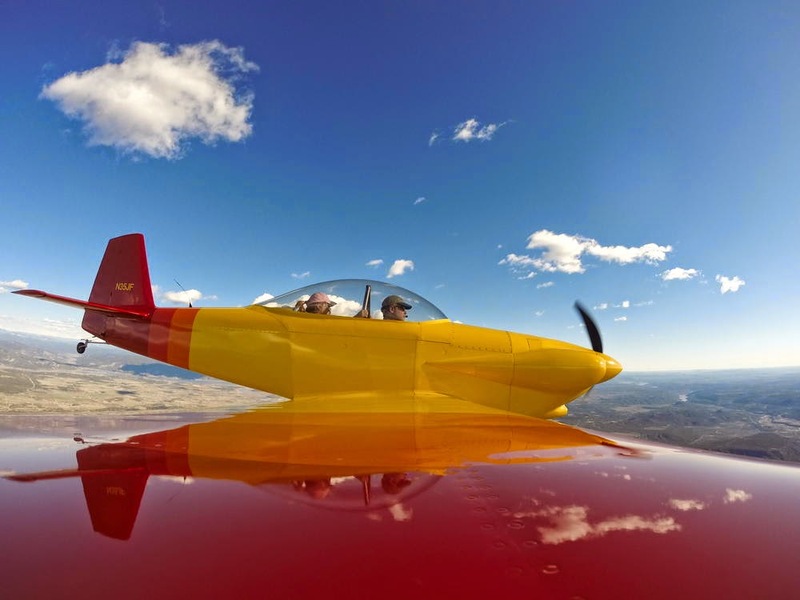 John Field placed a GoPro camera on the tip of his airplane’s wing during a flight to Arizona with Lora James riding as his passenger. MARTINSBURG, BLAIR COUNTY -- We found that 9 seater-planes coming in and out of the Altoona-Blair County Airport are rarely full and sometimes don't carry anyone at all. It's no secret that the new air service at the Altoona-Blair County Airport had trouble taking off in December. Tracy Plessinger, Manager, Altoona-Blair County Airport, said, "Well it was a rough start during the winter. Of course we had terrible winter weather." According to the Federal Aviation Administration, traffic at the airport has been heading on a downward trend since 2009 -- carrying less than 4,000 passengers in 2013, but officials say since switching to Sun Air Express, the flights are more reliable. "We think that's going to grow once people have confidence and flights,” he said. “I still get calls from people saying if I book a flight is it going to go." Explore Altoona says they're excited to see the potential these flights could bring. Mark Ickes, Executive Director of Explore Altoona, said, "Certainly any form of transportation is important in getting visitors and outsiders into the county in order to drive visitor spending." The airport has four round-trip flights between Pittsburgh and Altoona each weekday. The airport is part of the Essential Air Service program. EAS is a federal government program to bring service to smaller airports and it helps underwrite the costs. "The piece of the cost that is not covered by the $29 ticket is part of the EAS program and the reimbursement the airline gets for flying the flights,” said Plessinger. While we were there, a plane from Pittsburgh landed with no one on it. "The flights fly on time whether there's a passenger or if there's only one or two passengers,” Plessinger said. “The flight always flies on time." That flight turned around and went back to Pittsburgh -- again with no passengers on board. Plessinger says in order for the air carrier to get federal money, they have to fly a certain number of times per day. "The flights go whether or not there's a passenger on that particular flight or not,” he said. The airport says flights are reliable so now is the time to begin aggressively marketing and get people to fill those seats. Right now -- the airport is averaging 12 passengers a day. Officials say that is a mix of business and vacation travel, but that is not enough. In order to keep these flights in the air, they need to average 33 passengers a day. There is a two year window to make that happen -- or they could lose the federal dollars. The noncertificated pilot was conducting a personal flight in the experimental amateur-built airplane. A witness reported seeing the airplane circling overhead about 200 to 300 ft above ground level. According to the witness, the airplane's engine was running normally. The witness reported that during the third circle, the airspeed was low, the wings were level, and the pilot was turning the airplane using only the rudder. The witness heard the engine noise stop, and the airplane "flipped over to the left" and descended in a nose-down attitude to ground impact. Postaccident examination of the airframe and engine revealed no evidence of mechanical malfunctions or failures that would have precluded normal operation. The propeller blades displayed no evidence of rotational damage, indicating that the engine was not producing power at ground impact. An engine run was conducted, and the engine started and ran smoothly. Although it is possible that the uncoordinated (wings level) turns the pilot was making caused fuel to move away from the fuel tank ports resulting in fuel starvation, the reason for the loss of engine power was not determined. The pilot did not hold any type of pilot certificate, a medical certificate, or a valid driver's license and his flight time is unknown. It is likely that as the pilot maneuvered the airplane at a low altitude, he allowed the airspeed to decay to the point of exceeding the wing's critical angle-of-attack, which resulted in an aerodynamic stall. Further, it is likely that the pilot was lacking in flight training and experience, which prevented him from maintaining control of the airplane. Toxicological testing identified diphenhydramine, a sedating antihistamine, in the pilot's blood and urine, but the pilot's decision to perform turns at low altitude was likely not due to the effects of diphenhydramine. The noncertificated pilot's failure to maintain airspeed following a loss of engine power while maneuvering at a low altitude, which resulted in the airplane's wing exceeding its critical angle-of-attack and a subsequent aerodynamic stall. The reason for the loss of engine power could not be determined because postaccident examination revealed no evidence of mechanical failure or malfunction. On April 30, 2015, about 1257 mountain daylight time, an experimental amateur-built Hoffman Zenith 701, N95MH, sustained substantial damage when it impacted terrain about 2.5 miles north of Trinidad, Colorado. The non-certificated pilot received fatal injuries. The airplane was registered to a private individual and was operated by the non-certificated pilot under the provisions of the 14 Code of Federal Regulations Part 91 as a personal flight. Visual meteorological conditions prevailed at the time of the accident. No flight plan was filed. The time and place of departure, and the destination airport, are unknown. A witness who lived near the accident site reported the he heard the airplane approaching from the east and he went outside to observe the airplane. He saw the airplane making two left hand circles overhead about 200 to 300 feet above ground level. He could see the pilot wearing a headset and sunglasses. The engine was running normally and was "revved out." The witness reported that on the third circle, the airplane "floated." He stated that the pilot was turning the airplane by using the rudder, the wings were not banked to the left, and the airspeed was low. He reported that the engine noise stopped, and the airplane flipped over to the left and went straight down. He reported that the nose of airplane rose slightly before ground impact. The 53-year-old pilot was not a certificated pilot and he did not hold a medical certificate. The pilot did not possess a valid driver's license, but did have a valid Colorado identification card. The pilot's flight time was unknown. The airplane was an experimental amateur-built Hoffman Zenith 701, serial number 001, manufactured in 2009. The engine was a 100-horsepower Rotax 912 ULS-2, serial number 5651969. It seated two and had a maximum gross weight of 1,100 lbs. The maintenance logbooks were not obtained during the investigation. The hour meter on board the airplane indicated that it had a total of 435 hours. The airplane was equipped with a Dynon EFIS-D10A, a 4-inch flight instrument display. The airplane's fuselage and wings were originally painted in red, yellow, and white. The horizontal stabilizer was painted red, the vertical stabilizer was painted yellow, and the rudder was painted in a white and black checkerboard pattern. Witnesses reported that the pilot was in an earlier accident in the airplane in 2014 that resulted in substantial damage to the nose gear, engine compartment, and both wings of the airplane. Both wings were replaced and the nose and engine compartment was repaired. The airplane was then painted white. At 1354, the surface weather observation at Perry Stokes Airport (TAD), Trinidad, Colorado, located about 10 miles to the northeast of the accident site, was: wind variable at 3 kts; visibility 10 miles; sky clear; temperature 25 degrees C; dew point -1 degrees C; altimeter 30.01 inches of mercury. The examination of the accident site revealed that the airplane impacted the terrain on a heading of 55 degrees magnetic. The wreckage was about 12 feet from the initial impact point and was inverted. The wreckage exhibited significant crushing and buckling, but it was largely intact. The nose wheel was pushed aft. The leading edges and the bottoms of the left and right wings exhibited aft crushing and buckling. The cockpit was crushed aft. The floorboards had been cut by the first responders. The fuselage and empennage exhibited buckling, but the horizontal and vertical stabilizers received minimal damage. The check of the flight controls revealed that the rudder cables exhibited continuity from the rudder pedals to the rudder bellcrank. The elevator push/pull tube was separated at the bottom of the control stick with a fracture surface consistent with overload; otherwise, the elevator cables and attach points exhibited continuity. The aileron control system exhibited continuity from the control stick to the attach points on the left and right ailerons. The leading edges of the three-bladed composite propeller blades revealed minimal damage. One blade remained attached to the propeller hub and it was not visibly damaged. One blade was separated from the propeller hub at the base of the blade. No other damage was noted. The third blade was broken about 10 inches from the blade root. The engine exhibited minimal damage. The crankshaft was rotated and thumb compression and suction were confirmed on all four cylinders. The cockpit fuel selector was found on the right tank. Both the fuel tanks were inverted and had little fuel in either tank when examined. The right tank had less that a pint of fuel drained from it. The ground underneath both fuel tanks was examined, and it was wet and smelled like aviation fuel. The examination of the wreckage revealed that almost the entire airplane had been painted white, with only two large squares on the top of the fuselage still painted yellow. There were no aircraft registration numbers painted on the sides or tail of the airplane. The airplane's data plate indicated that the Federal Aviation Administration's register number for the airplane was N95MH. The airframe and engine were taken to an airplane retrieval facility for further examination. The Dynon EFIS-D10A was sent to the National Transportation Safety Board's (NTSB) Vehicle Recorder Division for examination. The autopsy of the pilot was performed at the El Paso County Coroner's Office, Colorado Springs, Colorado, on May 2, 2015. The cause of death was multiple blunt force injuries. A Forensic Toxicology Fatal Accident Report was prepared by the FAA Civil Aerospace Medical Institute. Diphenhydramine was detected in the urine and blood. Naproxen was detected in the urine. Carbon monoxide (12%) was detected in the blood. Diphenhydramine is a sedating antihistamine used to treat allergy symptoms and as a sleep aid. It is available over the counter with the names Benadryl and Unisom (as well as many others). Naproxen is an anti-inflammatory analgesic available over the counter with the name Aleve. The NTSB Vehicle Recorder Division examined the Dynon EFIS-D10A. Depending on the firmware version of the unit, the Dynon has the ability to log data to internal memory. According to the manufacturer, the firmware versions 5.0 and later have the ability to log certain parameters. However, upon interrogating the unit using the manufacturer's software, it was determined that the unit had version 2.19, which does not support data logging. Therefore, there was no data recorded on the device. The airplane's fuel system was examined and it exhibited continuity from the fuel tanks in the wings to the engine. The breaks in the fuel lines were consistent with impact damage. The Facet automotive fuel pump was tested and it operated when electrical power was applied. An engine run was conducted and the engine started immediately and it ran smooth. However, due to the impact damage to the oil pump fixture, the engine was only run at idle power and for a short duration. The engine run was conducted a second time with the same results. The current owner of the airplane purchased the airplane in April 2014. On December 11, 2014, the airplane owner reported to the Longmont Police department that the airplane was missing and it was described as "Lost Property." On December 24, 2014, the owner made a written statement indicating that he was the sole owner of the airplane and that he reported the theft of the airplane to the Longmont Police Department. The written statement did not authorize the accident pilot to be in possession of the airplane. On April 30, 2015, about 1257 mountain daylight time, an experimental amateur-built Hoffman Zenith 701, N95MH, sustained substantial damage when it impacted terrain about 2.5 miles north of Trinidad, Colorado. The non-certificated pilot received fatal injuries. The airplane was registered to a private individual and was operated by the non-certificated pilot under the provisions of the 14 Code of Federal Regulations Part 91 as a personal flight. Visual meteorological conditions prevailed at the time of the accident. No flight plan was filed. The departure airport, time of departure, and destination airport are unknown. A witness who lived near the accident site reported the he heard the airplane approaching from the east and he went outside to observe the airplane. He saw the airplane making two left hand circles overhead about 200 to 300 feet above ground level. He could see the pilot wearing a headset and sunglasses. The engine was running normally and was "revved out." The witness reported that on the third circle, the airplane "floated." He stated that the pilot was turning the airplane by using the rudder, and the wings were not banked to the left and the airspeed was low. He reported that the engine noise stopped, and the airplane flipped over to the left and went straight down. He reported that the nose of airplane rose slightly before ground impact. The examination of the accident site revealed that the airplane impacted the terrain on a heading of 055 degrees magnetic. The wreckage was about 12 feet from the initial impact point and was inverted. The wreckage exhibited significant crushing and buckling, but it was largely intact. The nose wheel was pushed aft. The leading edges and the bottoms of the left and right wings exhibited aft crushing and buckling. The cockpit was crushed aft and the floorboards had been cut by the first responders. The fuselage and empennage exhibited buckling, but the horizontal and vertical stabilizers received minimal damage. The check of the flight controls revealed that the rudder cables exhibited continuity from the rudder pedals to the rudder bellcrank. The elevator push/pull tube was separated at the bottom of the control stick with a fracture surface consistent with overload; otherwise, the elevator cables and attach points exhibited continuity. The aileron control system exhibited continuity from the control stick to the attach points on the left and right ailerons. The cockpit fuel selector was found on the right tank. Both the fuel tanks were inverted and had little fuel in either tank when examined. The right tank had less that a pint of fuel drained from it. The ground underneath both fuel tanks was examined; it was wet and smelled like aviation fuel. The examination of the wreckage revealed that almost the entire airplane had been painted white. There were no aircraft registration numbers painted on the sides or tail of the airplane. The airplane's data plate indicated that the Federal Aviation Administration's register number for the airplane was N95MH. The examination of the wreckage revealed that the airplane's original paint scheme before it had been painted white was yellow, red, and white; and the rudder was painted in a checkerboard pattern. Gregory Arlen Frank, of Loveland, died April 30, 2015 in Trinidad, Colorado. He was 53. Greg was born on March 5, 1962 to Leonard Arlen Frank and Maureen Reiter Frank in Denver, Colorado. Gregory was an adventurous soul. He took up dirt bike riding at a young age. He raced on a local, regional and even national scene for many years. He enjoyed fishing and 4-wheeling as well. He had been flying for three years, passionately pursuing this exciting venture. Surviving are his father of Loveland; a sister Tina Frank of Loveland; a brother Todd (Julie) Frank of Loveland; nieces and nephews Zach (Brittany) Frank, Ren Frank, Beth (Josh) Welsh, David Adams and Tiffany Adams; and numerous cousins, aunts, uncles and many dear friends. Services will be held at 2:00 p.m., Friday, May 8 at the Howe Mortuary Chapel, Longmont. A cremation has been entrusted to Howe Mortuary. Contributions may be made to the Humane Society in c/o Howe Mortuary, 439 Coffman St, Longmont, CO 80501. The Las Animas County Sheriff’s Office said the site of the deadly airplane crash that occurred Thursday has been cleared by the Federal Aviation Administration and the National Transportation Safety Board. The pilot and lone occupant of the plane, who hasn’t been identified yet pending the notification of his next-of-kin, was killed in the crash that occurred north of Trinidad near the Las Animas County Fairgrounds around 1 p.m. Thursday. Investigation into the airplane’s departure and direction is still pending, the sheriff’s office said in a press release. The airplane was listed as missing with the Longmont Police Department in November 2014, according to the sheriff’s office. An investigation into the accident, which is being handled by the FAA and NTSB, is ongoing. TRINIDAD - The Las Animas County Sheriff's Office has confirmed that a small plane has crashed near Trinidad. According to Undersheriff Derek Navarette, a single engine prop-plane went down around 1 p.m. in a field just west County Road 71.1 near the Las Animas County Fairgrounds. The only occupant, the pilot, was killed in the crash. Navarette says witnesses told him that the plane was circling the field before crashing. The Trinidad Chronicle-News reports the wreckage will be removed Friday. The NTSB will respond Friday to investigate. Personnel from the Trinidad Fire Department, Las Animas County Sheriff's Office and Colorado State Patrol responded. The pilot's name hasn't been released. 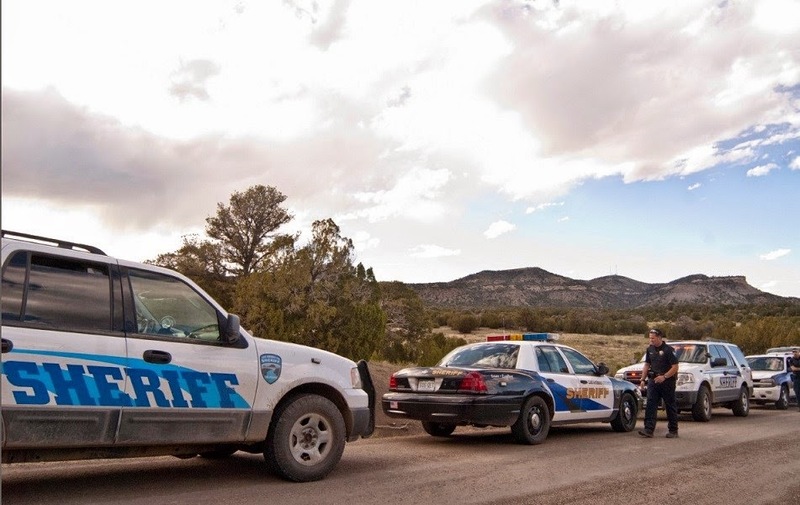 TRINIDAD, Colo. — A man was killed in a small plane crash near Trinidad Thursday afternoon. The Las Animas County Sheriff’s Office said the crash happened around 1 p.m. about a mile from the Las Animas County Fairgrounds. The single-engine plane went down about 300 yards west of County Road 71.1. Deputies said the pilot, a man in his 50s, was killed in the crash. No one else was in the plane. Investigators have not yet determined what caused the crash. A witness told Las Animas County deputies that the plane circled over his property several times before going down. The Federal Aviation Administration and the National Transportation Safety Board are investigating the crash, along with the Las Animas County Sheriff’s Office. 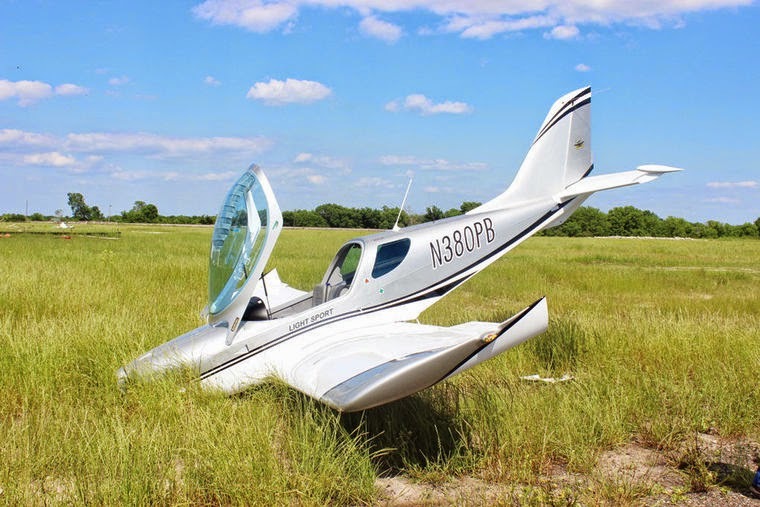 A Dallas pilot trying to land his single-engine plane after the craft’s canopy opened up received only minor cuts when his aircraft ended up nose first after a hard landing at Corsicana Municipal Airport Thursday. The incident occurred shortly before 4 p.m. as Peter Bogda, 69, of Dallas, had taken off in his Czech Sport Aircraft Sportcruiser after a day visiting Corsicana. Bogda, who was alone in the two-seater plane, had just taken off from the local airport when the canopy, which was supposed to open only slightly, opened up all the way. “When that happened, he didn’t have enough power to overcome the resistance, and was losing airspeed,” explained Gary Farley, base operator at C. David Campbell Field. Farley said the plane came back around and Bogda tried to land on the runway. One of the plane’s propeller blades broke during the slide off the taxiway, and the plane’s landing gear appeared to be damaged. There was no fire or fuel leaking from the plane. The plane ended up in the grass next to the runway, nose down. Bogda was treated at the scene by Corsicana EMS for minor cuts. The Texas Department of Public Safety is investigating the incident. A federal appeals court on Thursday vacated a 2 1/2-year prison sentence handed to a North Hollywood man who shined a laser at a business jet and then aimed the “commercial-grade” device at a police helicopter sent to find the source. A three-judge panel of the U.S. 9th Circuit Court of Appeals in Pasadena ordered that 21-year-old Adam Gardenhire be resentenced in Los Angeles federal court. Gardenhire pleaded guilty in October 2012 to a single federal count of aiming a laser pointer at an aircraft. According to the U.S. Attorney’s Office, Gardenhire pointed the laser at a Cessna Citation on March 29, 2012, as the pilot was preparing to land at Bob Hope Airport in Burbank, leaving the pilot with vision impairment that lasted several hours. 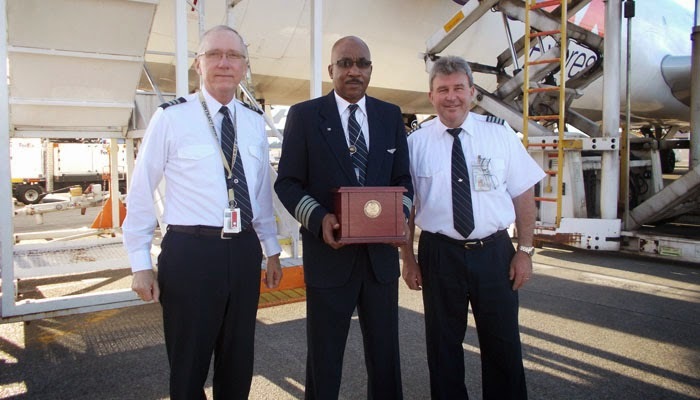 MEMPHIS, TN (WMC) - FedEx held a Final Flight Ceremony on Thursday honoring the global shipping company's first African-American pilot. Carroll Waters died at 78-years-old. His ashes will be sent to his final resting place in Virginia. FedEx says Waters was known for his personal motto, "the sky isn't the limit." Waters first took to the skies as a combat pilot and original member of the famed Tuskegee Airmen. He became a FedEx pilot in 1973, after earning a Bronze Star, Air, and National Defense Service medals. On January 1 of that year, Waters told FedEx founder Fred Smith by phone, "I'm a black pilot and I'm looking for a job." Smith's response was, "When can you get here?" Waters became employee number 373, the third of the fledgling company's three pilots. Shortly before Waters' death, he spoke at an event and remembered a time when he carried only 20 packages on his first flight. After 23 years at FedEx, Waters retired in 1996. FedEx says, at this time, 129 of its' 4,200 pilots are African-American. WMC Action News 5's Kontji Anthony attended Thursday's ceremony and will bring you reaction from his contemporaries and proteges. Video of the Macon County Airport Authority meeting that took place on April 28, 2015. 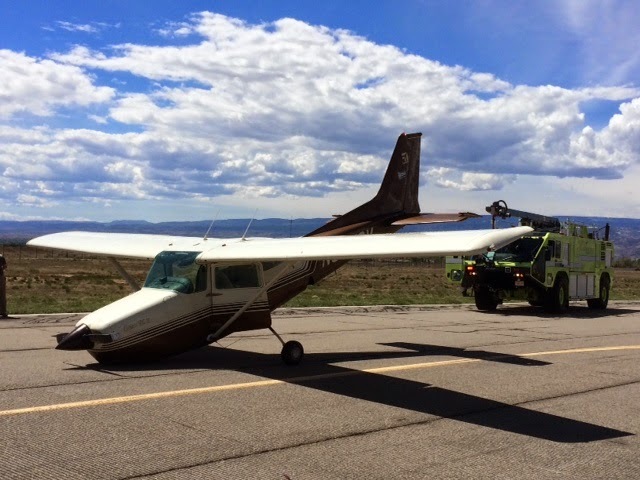 GRAND JUNCTION, Colo. A Cessna plane landing at the Grand Junction Regional Airport has landed safely, after losing landing gear capabilities in the nose of the plane just after 11:30 AM this morning. Crews on scene said the pilot of the plane spent 45 minutes trying to manually lower the nose gear, but could not get it to lower. The plane flew past the airport tower, which confirmed the nose gear was not lowered. According to the Grand Junction Regional Airport, there were two people on board the aircraft. The pilot made an emergency landing on Runway 4, as the pilot kept the plane back on the wheels as long as possible, then came down on the nose of the plane to land. There were no reported injuries, and minimal damage to the nose of the plane, along with the propeller. The Grand Junction Regional Airport says crews are working to remove the aircraft from the runway. A Columbus Division of Police helicopter made a precautionary landing this afternoon on the Northeast Side, the second time in 24 hours that a division pilot was forced to touch down unexpectedly. The latest landing occurred at 1:50 p.m. in the area of New Albany Road and Walton Parkway, north of Rt. 161. The aircraft landed without incident, and no injuries were reported, police said. It is not clear if the landing involved the same aircraft that made a precautionary landing on the Far West Side late last night. In that incident, a police pilot put a helicopter down in a parking lot off Hilliard-Rome Road just before midnight, after a warning light came on. No injuries occurred in that incident. TECUMSEH -- Skydive Tecumseh launched a scaled-back operation 18 miles from its home base in Tecumseh on Sunday. Skydivers jumped from the company’s airplane at Napoleon Airport, two days after a Lenawee County Circuit Court judge ruled she could not order temporary access to Al Meyers Airport while a lawsuit between the companies is fought. The Tecumseh airport’s new owner, Andrew Aalto, banned Skydive Tecumseh from his runway in January, citing safety concerns and a desire to develop other airport business. The flights from Napoleon Airport were described as “an additional operation” by Skydive Tecumseh’s attorney, David Stimpson of Tecumseh. Parachuting at Napoleon Airport allows the business to survive while a permanent solution is worked out, Stimpson said. “They don’t have the ability to operate at the same level anywhere else,” Stimpson said. Skydive Tecumseh has a building and infrastructure on its property adjacent to the Al Meyers Airport to accommodate the volume of customers it had served. There are active discussions with other airports, he said. And a lawsuit against Al Meyers Airport is ongoing that could lead to a restoration of access, he said. Napoleon Airport owner Anthony Hurst said he welcomes Skydive Tecumseh to his community. “Yes, I think the restaurants and businesses in the area would welcome them with open arms,” Hurst said. The business served 30 or 40 skydivers at Napoleon Airport on Sunday, he said. He expects Skydive Tecumseh will be flying from the airport again this weekend. Napoleon Airport hosted another parachuting service in the past. It relocated 10 or 15 years ago for business reasons, Hurst said. Hurst said he was impressed with how Skydive Tecumseh operated on Sunday. “It went very well. They run a very safe operation. They’re very conscious of maintaining safety,” he said. The two grass runways at Napoleon are comparable to the turf runway Skydive Tecumseh used at Al Meyers Airport, Hurst said. But Napoleon Airport does not have facilities to replace Skydive Tecumseh’s infrastructure in Tecumseh. Stimpson said there is no airport in Lenawee County to where Skydive Tecumseh can relocate its full operation. The Lenawee County Airport in Madison Township has too many other operations to accommodate a skydiving business, he said. Some of the independent contractors employed by the business will not have work this season, he said, without access to Al Meyers Airport.